An impulse buy of figs at the grocery store had me digging through books looking for the perfect thing to do with them. When I looked in the index of 1000 Vegan Recipes, I found exactly what I wanted: fig, shallot & basil focaccia. I had been toying with the idea of making fig bruschetta with cashew cream, which Seth and I had at the Millennium in San Francisco. It was amazing, but I wasn’t sure that I could do it justice by trying to recreate it at home (I knew I couldn't). 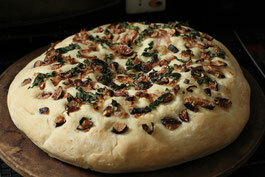 The focaccia seemed like the perfect way for me to use the figs and still get to make bread. The recipe is pretty easy to make and when the dough was just about finished rising, I sliced and cooked the shallots and chopped the figs. It bakes pretty quickly. I’m not sure why mine didn’t rise as much in the center as the outer edges did, but it was still delicious. The shallots, basil and figs are a perfect combination. We also had a little olive oil with kosher salt and a little pepper in it for dipping. Super yum. I recently recommended the Three Bean Cassoulet recipe (also in 1000 Vegan Recipes) to a friend, and decided it would be a good fit with the bread. The recipe calls for canned beans, but I went ahead and soaked and cooked dry beans the day before. The three kinds of beans are cannellini, great northern and navy beans. While they all more or less taste about the same, the different sizes and textures are fun. I baked the bread first and then the cassoulet be cause they need different temperatures. The bread bakes quickly, in about 20 minutes, so it wasn’t that big of a deal. (I warmed it up for a couple of minutes before serving so it was still hot.) 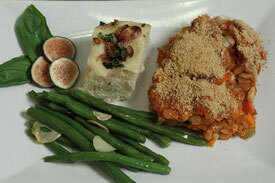 The cassoulet is very homey and cozy and delicious. The recipe makes a lot, so I try to make it early in the week so there are leftovers for hearty lunches. I’ve been on a bit of a garlic green beans kick lately, so I steamed some fresh beans and then sautéed them in about a teaspoon of olive oil and a large clove of thinly sliced garlic. A little salt and pepper and you’re all set.